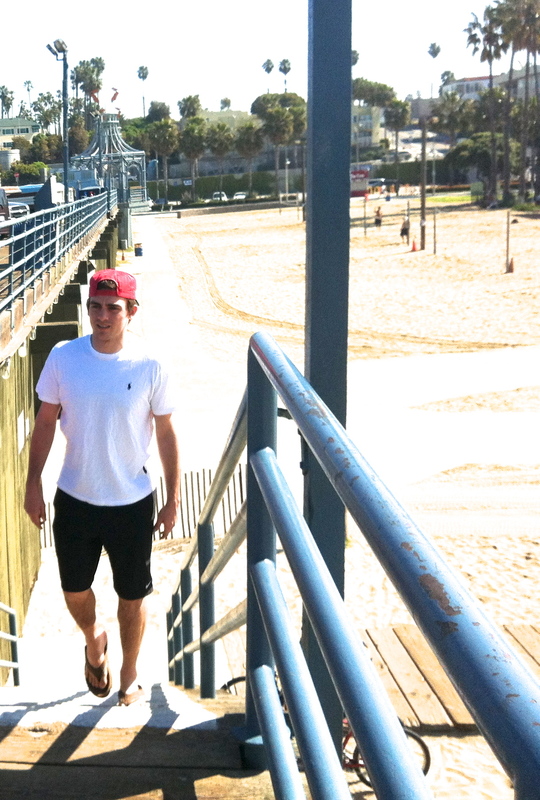 Here’s my boy on our trip to visit California colleges last April. He’s ready for the next step. But am I? I am still sick with the crud. What is this thing? You need to NOT get it. I hope you can’t catch it from reading the blog. Anyway, tomorrow is Jake’s last day of high school. Saying that out loud is like saying, “I woke up tall and blonde this morning.” (I will never be tall, or blonde, although that’s not entirely true, since I was blonde for like a few weeks a month ago when my hairdresser went a little light on the highlights and turned me into Malibu Barbie.) Anyway, I am not even sure how this is possible, but tomorrow is the last time Jake will enter BHS as a student. Life is such a funny little thing. Nobody tells you how really funny it is–you just have to experience it for yourself. I only remember the end of high school in a very foggy light. Little snippets, small moments. A cool dress my sister let me borrow to wear to Senior Night. My family in the stands of the Wildcat’s home football field watching me get my dipoloma in my dorky white cap and gown. The giant picnic my parents threw for me. And that’s really all. I don’t remember anything else. Except that I felt odd, displaced, strange. I guess there was a happiness, but I don’t remember it overwhelming me. I guess I went to the Cape for a month that summer, as usual, but I don’t remember it being remarkable, or especially better than any other summer on the Cape. Anyway, I want to make this transition special for Jake, but I have to say, this end of high school is overwhelming me with all the feeling I didn’t have during my own graduation. It’s not that millions of kids don’t do this every year that makes it such a landmark moment, it’s that it’s the real beginning of the end of your child’s life in your house. This is the part of graduation that is remarkable. That the day to day tending, nurturing, coaching, coaxing, cajoling, poking and loving your child is done with. I don’t mean that in a maudlin, or dramatic way. And I don’t mean that I won’t continue to do that to Jake, I just mean it as what it is, factual. It’s real and it’s big. Your kid is on his way to having to begin a life on his own. I will miss that boy and his pile of clothes in the middle of his room. I will long for his silly jokes and his hugs, and his insights. I will even miss nagging him to do stuff (maybe I’m overstating here, yeah, I WILL NOT MISS THE NAGGING HIM TO DO STUFF.) In short, I will miss every single thing about this boy who made me a mom. He is the most special thing that’s ever happened to me (along with that girl). Anyway, I have been trying to create this album for him. It’s forced me to sift through the literally thousands of photos of our family that I have amassed. It’s not like me, but I can’t pull it together. Every time I think of a plan for the book, I think it’s not special enough, and I want to take a nap, or try heroin for the first time. It’s not hard to psychoanalyze myself here. I don’t need a degree. I am totally engulfed in the emotion of seeing not only his life in pictures, but also my own. Where did that time go? Is that why people are always saying that–“Where did the time go?” Because it’s impossible to understand its passing. I mean, IMPOSSIBLE. If he’s older, so am I. After 18 years of hard labor (privIleged, incredible labor, not to mention that really awful labor before the epidural) I’m done. Just like that. I’m in transition, too. And I’ve never been good at those. They take me a good long time to embrace. I’m better at middles. Middles are much more my thing. Today I am grateful for transitions ,even though I hate them, they’re what prepare you for what’s next. They may cause you to be swarmed with feelings, like six year olds around a birthday pinata, but they are a must. So, I will let myself jump into the transitional pool and learn to swim. And then, I will get on with making that album. It won’t be perfect, or as special as I want it to be, but it will be from my heart, for my boy. Who will always be my boy (and hopefully will remember those 18 years with as much love as I do). I’m obviously over a year late with this comment, but had to say these have been my exact feelings. My son is about to come home for his first thanksgiving as a college guy and I’m counting the seconds and a little anxious for him to love his east coast home as much as he now loves his west coast life at school.